« so, who’s trawling for spam today ? The widespread appeal of the latest instalment of the Big Brother series is further illustrated by its considerable online impact. After one full week of screening, Big Brother Australia became the 18th most frequently visited website by Australian Internet users and the most popular ‘Television – Programme’ website with a market share of 55% as of the week ending May 15. 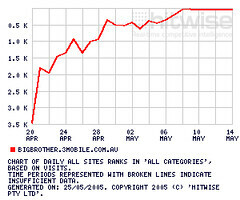 Page Impression data available for the same period suggests that bigbrother.3mobile.com.au accounts for almost 1% of total Australian Internet activity. Although the websites popularity appears to be stabilising this week ranking 21st overall, Hitwise expects the website’s market share to spike as key events unfold in the unscripted drama. The most popular search phrase employed by website visitors was ‘big brother’, accounting for 36.62% of all search terms that delivered users to the website. 74.64% of searches used a combination of two or three search terms. Google Australia (www.google.com.au) delivered 58% of search engine traffic to the website, while Yahoo! Australia & New Zealand Search (au.search.yahoo.com) accounted for 13% and relative newcomer ninemsn Search (search.ninemsn.com.au) provided the site with a further 11%. This entry was posted on May 27, 2005 at 4:09 am and is filed under Uncategorized. You can follow any responses to this entry through the RSS 2.0 feed. You can leave a response, or trackback from your own site.